Since 1989 JYSK has been a proud sponsor of Para athletes. It all began in 1988, when Danish Para athletes were very successful at the Paralympics in Seoul, South Korea. However, the athletes were in severe lack of funding for the preparation towards the next Paralympic event. As of June 1989 JYSK stepped in as main sponsor of Parasport Denmark, and we have been sponsor ever since. This makes it one of the longest lasting sports sponsorships in Denmark, and JYSK are proud to have been supporting the athletes to achieve great results through the years. Since 1989 the sponsorship has been extended to other countries, as JYSK has expanded and opened new stores in other parts of the world. Today JYSK is the main sponsor of Parasport associations in Denmark and Norway while also supporting the National Paralympic Committees in Sweden, Finland, Czech Republic, Slovakia and Romania, while JYSK franchise partners support Para athletes in Canada, Iceland and the Faroe Islands. JYSK is founded on dedication for the business and a strong will to make ideas into reality, to make JYSK the most widespread and profitable chain of stores in the world. Winning mentality, dedication and the will to fight against all odds are something, which JYSK have in common with most successful Para athletes. They have taken the decision not to be limited by their disability, but instead to challenge their physical limits in order to achieve their goal and be successful both in sports and on a personal level. Our sponsorship of the world´s greatest Para athletes is built on the common understanding that the dedication and will to win is what paves the road to great achievements and possibilities. The willpower and the dedication of the athletes inspires everyone in JYSK, and we are proud to support their efforts. 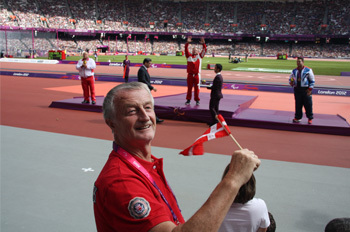 JYSK owner Lars Larsen has over the years followed the athletes closely. Here he is at the Paralympic Games in London 2012.